You will always find the family of loons on our lake and there are always bald eagles, hawks and beaver kicking around taking care of their daily business. Rainbow trout swim these waters, watch for them jumping at dusk. Chances are good that you will see a mule deer either on your travels into our valley or walking by your chalet. 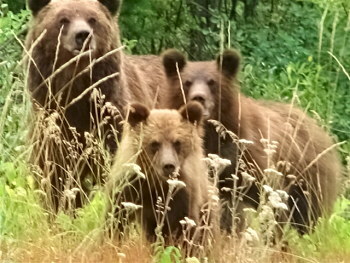 If you are lucky catching a glimpse of a grizzly bear, black bear, coyote or moose may be in the cards for you. On the rarest of occasions a wolf, cougar, lynx or bobcat may be spotted out of the corner of your eye, but, that is only for a few fortunate travelers as they are illusive and have a tendency to keep to themselves. 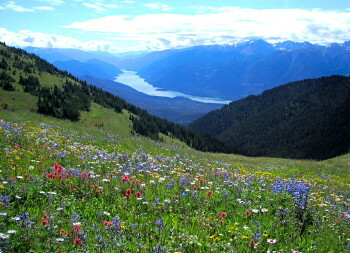 Naturally, wild flowers abound in the late spring and early summer. As the heat of summer builds, heading into the back country is where you will find the most amazing display of wilderness flowers and stunning views of the mountains and valleys. Getting into the back country can be done a few different ways. Well, you can walk of course, if time permits in 2 ½ hours you can be in the alpine. Mountain biking is another amazing way to experience the back country trails, either from the chalet doors or with the assistance of the local float plane. With the float plane you and your bikes can be dropped at an alpine lake and with lunch in hand you can ride back to the chalets. This is for the experienced rider for sure, but, if mountain biking experience you lack, perhaps flying into Spruce Lake and walking out is for you. New GPS based maps are available. Discover more about Mountain Biking in our area. 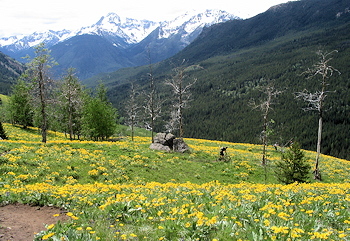 Click here for maps and information on mountain biking trails in the Chilcotins. Maybe having a go at seeing the back country by horse is what works for you. There are a couple horseback riding outfits in our area that offer amazing experiences ranging from one hour to overnight rides. The summer and fall season is a great time to explore the back roads. With the snow pack a distant memory, you can find your way, by motorcycle, ATV or four wheel drive down endless ribbons or old forestry roads. Make sure you pack your fishing rod on your afternoon adventure because the road side lakes abound. Most of the ponds and lakes in our area are stocked with either rainbow or brook trout. The towns of Gold Bridge and Bralorne are situated ½ hours drive from Tyaughton Lake. In Gold Bridge you will find a grocery store and a gas station. There is a hotel with a pub and restaurant. The economic development society operates a tourist center, with information on our historic area as well as high speed internet where you can pop in and check your emails. The historic town of Bralorne has a restored church and a small museum, where you can check out artifacts and history of our valley and how it came to be the 2nd largest gold mine in North America. Just visiting these towns and talking with the locals you will hear a story or two and share an experience that is impossible to find anywhere else.